Home Books What’s Your Heritage? Although it’s nice to know where your ancestors originate, it’s not always fun trying to teach that piece of family history to your child. Instead of sitting down with a complicated list of things you want them to know, next time just buy the My Heritage Book. Deanna Bufo Novak always held a special place in her heart for her Italian heritage. However, when she had her first child she suddenly wanted her daughter to eventually understand what makes her own, personal heritage so unique. So, she went to work on creating a personalized keepsake. What she really made was a business. Tell us a little about My Heritage Book. My Heritage Book is an award-winning, unique personalized children’s book celebrating heritage. Each hardcover book is custom made, has the child’s name throughout, and combines beautifully illustrated, fun, educational topics on up to four different countries. Through the book, parents, grandparents, other relatives, or friends can offer a child the unique opportunity to journey through the countries of his or her ancestors, creating treasured memories along the way. My Heritage Book has extraordinary intergenerational and education value, making it a wonderful keepsake gift for new babies and for children up to age 10. My Heritage Book costs $39.95 and can be ordered at www.myheritagebook.com and through select upscale children’s boutiques. Orders take approximately two to three weeks and are shipped to the customer or directly to the child (our holiday order deadline is 12/12). While I have loved writing and heritage since I was a child, it was actually the birth of my own daughter that inspired me to create this unique, high-quality keepsake. Shortly after her birth, I felt a need for her to learn about being Italian and to be proud of it, as I am, but also wanted her to learn and be proud of her Polish heritage from her dad. At the same time, I noticed that my mom suddenly seemed even more Italian and my mother-in-law seemed even more Polish! I realized they were trying to teach their granddaughter something very dear to their hearts, despite the fact that she was only a few weeks old! They were trying to teach her about her family’s traditions and values, and I thought she was a lucky little girl. I also thought every child should be so fortunate, and the idea for My Heritage Book was born! What is some of the information your book includes? Each hardcover book has the child’s name throughout, the child’s birth date, a letter to the child from the gift-giver(s), and beautifully illustrated, fun, educational topics on up to four different countries. There are currently 72 countries to choose from for inclusion in the book. Pages for the child to fill in his or her own family’s traditions and family tree are also provided, as well as a glossary of terms based on the countries included. If someone wanted to buy one of your books, what information would you need from him or her? To create a My Heritage Book, we need the child’s first, middle, and last names, birth date, closing information for the letter (for example, Merry Christmas! Love, Grandma and Grandpa), and up to four countries of the child’s heritage. What separates you from other personalized book companies? I am a huge fan of personalized books – they encourage reading by getting a child excited at seeing his or her name in a book. However, most personalized books stop there – they add a child’s name and other personalized information to a story or concept. There are no other personalized books that are custom made based on the countries of the child’s heritage. Not only does My Heritage Book encourage reading by including the child’s name, it also promotes family values and traditions by giving the child a sense of pride in his or her roots. Do you have any goals you’d like to accomplish over the next year or so? Many! 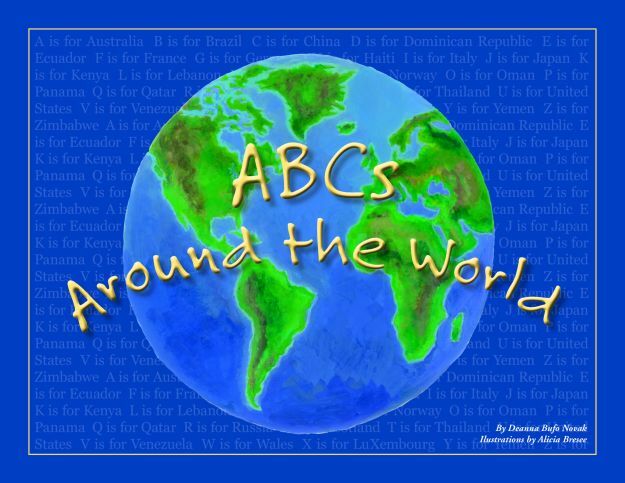 We are in the final stages of developing a new book and product line called ABCs Around the World to teach children their ABCs through 26 of the world’s beautiful countries. This will be the first line in the Around the World series to promote cultural awareness and acceptance. We are also developing a product line, including a cd with music from the countries, to go with My Heritage Book. With regard to distribution, we are in the process of working with some very large companies that would propel kidsHeritage, Inc. to the next level. My Heritage Book is the recipient of the 2011 Book of the Year Award (keepsakes category) from Creative Child Magazine. My Heritage Book also makes a wonderful gift for children adopted from other countries. Since heritage is a combination of where a child and his or her family were born and how that child will grow up, the book presents a unique opportunity to combine the child’s birth country, as well as the countries of his or her parents’ heritage. We want to keep the heritage conversation going with parents, grandparents, and educators. To join the conversation, please join us on our My Heritage Book facebook page! Do you have any advice you’d like to offer fellow author/entrepreneurs who are just getting started? Don’t give up! Be ready to work for it and to be frustrated at times, but if you really believe in what you have created, it will all come together and be very worth it in the end!